A lot of people prefer the new Audi Q7, which has recently got a nice update for 2010, with diesel engines because these are Audi’s diesel engines which means they are very powerful while being efficient. 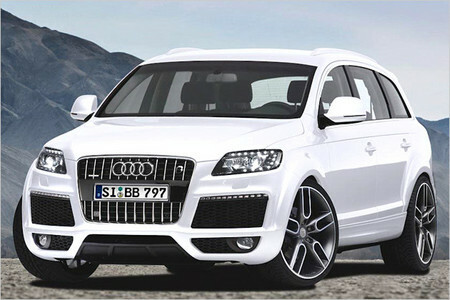 But for those who want even more, the German tuning company B&B has an extensive program to upgrade the Q7′s diesel engines to an insane level! 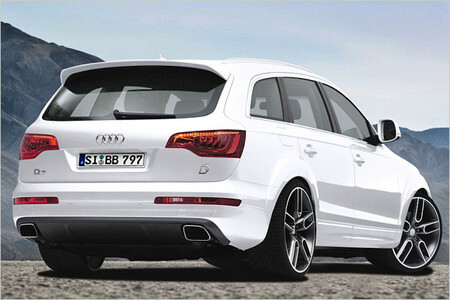 Starting with the best of the lot, Q7 V12 TDI, the tuner has bumped the power up to 595hp and 1270Nm. I know that’s unbelievable! This is met by a new ECU software and modifying the engine’s turbochargers for more boost and pressure. The other engine in Q7 4.2 TDI has also received a treat. There are two stages for this one, first a 375 hp 850 Nm of torque, and then a full 400 hp and 900 Nm of torque! mind you as the power goes up, the price of this packages also sky rocket! B&B also takes care of the aerodynamics and handling via a new body kit and suspension modifications as well as new and huge wheels. The car is actually dropped by 50 mm, which for a SUV is rather missing the point! but it looks great in combination with flared wheelarches and sport alloys available in 20”, 22” and 23”.